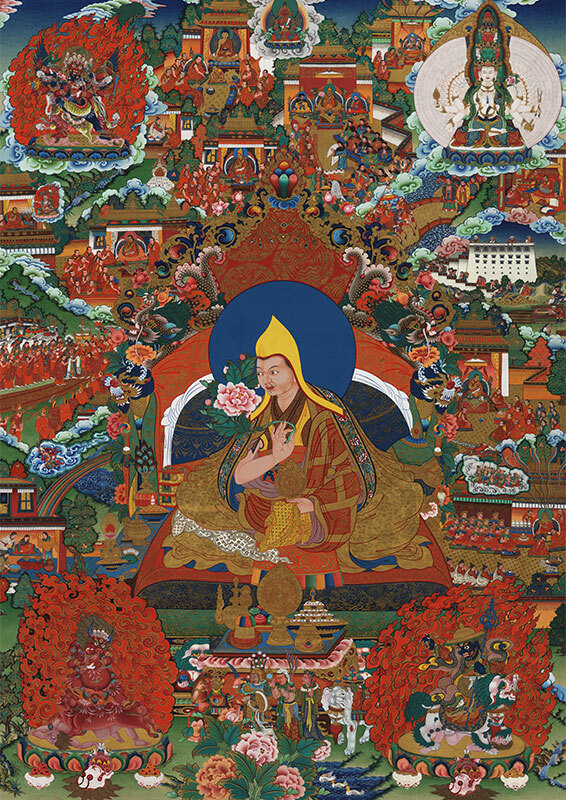 Ngawang Lobsang Gyatso know as The Great Fifth, was the first in the Dalai Lama lineage to hold temporal power over Tibet. A great spiritual figure, both erudite and a a highly realized tantric practitioner he unified Tibet and avoided potential conflict. One starry evening a monk residing in the house of Zahor dreamed of the family matriarch attempting to gain entry to her house through a window, though a pronounced bulge in her abdomen made this difficult. Just as she was struggling to get through, a goddess appeared and eased her through. Within the course of the next few months the lady of Zahor became noticeably pregnant and signs purporting an auspicious event became manifest; unusual flowers blossomed, a rain of flowers fell from a cloudless sky and rainbows were seen streaming out of the family house. As rumor of the miracles spread, members of the community began circumambulating the house daily. The child was born in the spring of the year 1618 and was named Mingyur Tobgyal Wangkyi Gyalpo. In the manner of many high incarnates in their early childhood, Mingyur exhibited signs of extreme independence, alertness and an inherent interest in religion. His childhood was also marked by his having miraculous visions of Buddhas and Bodhisattvas, and a seemingly prescient foresight into what was happening around him. Should be decorated with an auspicious scarf. There is no better color than gold. Excellent if the name is Dorje. The final selection was made by the Panchen Lama, tutor of the Fourth Dalai Lama, and Ligme Shabdrung, another high ranking scholar among the Gelukpas, on the basis of their divinations which both indicated Mingyur to be the true incarnation. The process of recognition having reached its conclusion, he was escorted to the Dalai Lama’s official residence, the Ganden Podrang in Drepung Monastery and enthroned on the seat of his predecessors. On the third lunar month of the year 1620, Mingyur’s head was shaved in an ordination ceremony, and he was given the name Lobsang Gyatso.